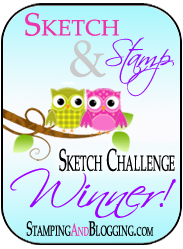 Hi Stampers, today I have a card share that was inspired by last weeks blog hop. Last week we had a color challenge and when I start making my cards I never really have an idea, I just start playing. When I was working with my baby wipe technique in making my wreath last week, I also stamped up some leaves from the Vintage Leaves stamp set. I did not end using those leaves and set them side. I then went on with my wreath idea. Fast forward to this weeks blog. In looking at the sketch, an idea crossed my mind, use those leaves! Voila, a card in the making. I took a few liberties, but that is what the sketch is, a starting off point for creativity. I turned the circle into my leaves and the banner on the top I just put horizontal instead of vertical. Have fun with the sketch and make some cards. The leaves were stamped with the Vintage Leaves stamp set using a fun technique with baby wipes. Layer about 5 folded baby wipes on a paper plate. Take your reinkers of Rich Razzleberry, Mint Macaroon and Delightful Dijon. Put droplets of the ink in a random pattern onto the baby wipe letting the colors touch and spread out a bit. I then used this as a stamp pad and inked my leaves. After I had my image I used the coordinating die to cut it out. This technique gave me a variegated fun look and blended the colors beautifully. The solid leaves were Rich Razzleberry and Delightful Dijon inked in the same color as the card stock and then cut with the matching die. Bling: I love the finishing detail of adding some gold sequins and basic pearls to complete the card. You can see the post here for another card made with the baby wipe technique. So, so pretty! Those leaves are gorgeous!!! Just beautiful! Love everything about it! How creative! Love the leaves using the baby wipe technique too. And that gorgeous bow takes center stage!